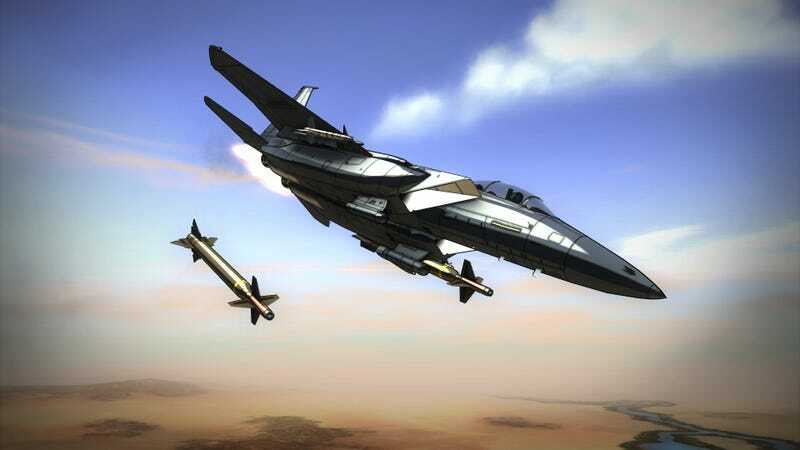 I could spend hours just staring at Vector Thrust's gorgeous cel-shaded models. They're just so pretty. They're the kid of models that make you think "Man, if these were in a game I'd buy that in a heartbeat. ", well luckily that game exists. What is Vector Thrust? It's hard to tell at this point, since the game itself is still very much a work in progress. Developer Time Symmetry states Vector Thrust is currently in alpha and it shows. While the game's jet models are stunning, the rest of the visuals are just window dressing. Environments are bland and lack detail, buildings are sparse and aren't to scale. Hangars are often much smaller than the planes that would inhabit them. There are no cities or towns, just wide open plains. This would be okay if all you did were dogfights, but plenty of missions have you taking out ground-based targets. Recent posts from the developer on the game's Steam forum, however, indicate maps will be improved in an upcoming update. As a game in alpha, Vector Thrust is full of bugs, but the basic concept of the game is pretty fun. One of my favorite modes is what's currently called Quick Action, a mode that selects your jet, loadout and map for you and puts you into a match with randomly-generated AI opponents. There's also a story mode, though the narrative is delivered via tiny subtitles at the top of the screen. Story missions often glitch and don't resolve, but again, the game is in alpha. Vector Thrust currently features about 200 planes, most of which are subtle variations on 40 unique models. Dogfights are fun, but target acquisition feels a bit rough. You can't get a missile lock on any target aside from the one you've selected. That small issue aside, flying and fighting feels fun. Flights feel good and maneuver well, but they feel a bit slow. I'd love to see this improved before release. So—the question you want answered—is Vector Thrust worth it? Maybe. It's a gorgeous game, and what's there is fun and loaded with potential. But, like any game in alpha, and most—if not all—games on Steam Early Access, it's very rough. Vector Thrust feels like the foundation of an excellent game. Something, that if built upon properly will be a must-have. It just isn't there yet. If you're willing to take the risk and want to play a gorgeous prototype, hop on this right now. It's very pretty and the developers listen to feedback. If you're a casual observer, wait a bit. There's a long road ahead for Vector Thrust. Let's hope they can draw at all that latent potential.